The 57th Regiment of Foot, raised in 1755, and the 77th Regiment of Foot, raised in 1787, later designated the West and East Middlesex Regiments respectively, first served alongside each other in the Peninsular War in 1811. It was during this campaign that the bravery of the men of the 57th, inspired by the leadership of Colonel Inglis, earned them the name of 'The Diehards'. The regiments remained distinct until the Cardwell Reforms of 1881 when they amalgamated as The Duke of Cambridge's Own (Middlesex Regiment) later amended to The Middlesex Regiment (Duke of Cambridge's Own). During the closing years of the reign of Queen Victoria it had become apparent that reorganisation and enlargement of the army was necessary to protect British overseas commitments. The Middlesex Regiment had been sharing a Depot at Hounslow with the Royal Fusiliers engaged in training recruits for the regular forces. In 1900 both regiments were increased in number from two to four Battalions rendering the Depot too small. The Military Works Acts of 1899 and 1901 provided the funds required for this expansion as part of which, in 1904, a new barracks to War Office design was constructed on previously undeveloped farmland at Mill Hill described as 'the latest thing in Military Accommodation in Great Britain'. In 1905 the barracks consisted of several accommodation blocks for other ranks, quarters for officers and NCOs, an Officers Mess, a Sergeants Mess, a dining hall, theatre, concert hall, gymnasium and stores together with 30 married quarters. The married quarters were however, unfinished and families were lodged in rented houses on the Mill Hill-Finchley borders. This no doubt helped to smooth the sudden introduction of some 300 people into a relatively small semi-rural parish. Reference to 'The Garden Barracks' instead of the official title of 'The Mill Hill Barracks', brought about by the embellishment of the site with plants and trees donated to the soldiers by the local villagers, indicates the rapid establishment of the good relationship between them which lasted throughout the Regiment's time in Mill Hill. The name Inglis Barracks was not used until around 1940. The Depot lies within what was then the Ecclesiastical District, now the Parish, of Mill Hill. The parish is served by the Church of St. Paul on The Ridgeway, the Minister of which has the duty of pastoral care of the district. At the time of arrival of the Regiment, the then incumbent had died whilst on holiday in France. Services were being conducted by assistant clergy and on 19th February 1905 the Rev. W.A Braine recorded that '12 recruits from the Barracks attended'. The number attending increased slowly in the weeks following until in early March the newly appointed Priest in Charge, the Rev. G. Goldring-Bird, held a service 'especially for the Troops' at which 150 soldiers were present. Shortly afterwards on May 29th, the Rev. E.B. Hartley was installed as Vicar. 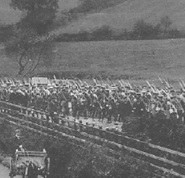 He revised the pattern of Sunday services to now include a Soldiers' Service at 9.30am each Sunday setting the pattern of Church Parades which lasted throughout his and his successor's Ministries until the outbreak of the First World War. 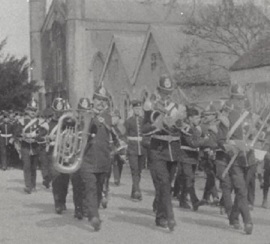 These Church Parades became a distinctive feature of the area as the troops in full uniform and led by their Band, marched between barracks and church accompanied by many of the local inhabitants. So began a relationship in which St. Paul's became, for the Regiment, its Garrison Church and the Incumbent its Padre. The connection was not however solely military. Within a short while entries in the church registers of Baptisms and Marriages appear with the address given simply as 'the Barracks'. The first baptism on May 14th 1905 is followed by fourteen more in the next twelve months. That fewer marriages are recorded is not unexpected as it was customary for this to take place in the bride's parish. It is worthy of note that the number increased significantly in the war years. Funerals too are infrequent due to the practice of burying soldiers where they die on active service. The first to be buried at St. Paul's was Edward Dodman in 1906 whose gravestone was erected 'by his comrades in the regiment'. A number of other memorials to individuals who died elsewhere are recorded on mural tablets within the church in an area which has come to be associated with the Regiment.